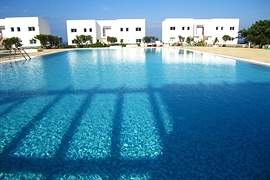 Holiday villas to rent in Tatlisu Village, as close as you can get to Karpas from Kyrenia. It's easy to reach your villa for rent in Tatlisu along the new coastal road, since this super-fast route from Kyrenia actually ends at Tatlisu. Beyond Tatlisu, small country roads wind away into the distance towards Kantara Castle and the rugged Karpas Peninsula, and behind the village the mountains form a beautiful backdrop. So, a Tatlisu holiday villa really does enjoy the best of both worlds, a great location that's easy to drive to! Tatlisu is a small Cypriot village that lies just east of its bigger neighbour, Esentepe. All Amy Villas rental villas in Tatlisu are within easy reach of the 18 hole international golf course at the Korineum Golf Club, excellent sandy beaches, good restaurants and even football matches at the Esentepe local stadium. Tatlisu is a relaxed little village in North Cyprus, with traditional small houses and a local village shop, and a surprisingly large and elegant church in white edged with golden stone. There is also a mini market at a nearby development, and a petrol station for topping up your rental car. Just 10 minutes drive from Tatlisu is Kaplica Beach, a lovely sandy bay overlooked by the ruins of Kantara Castle. Kaplica beach is ideal for a lazy day in the North Cyprus sun, either lying on the golden sands on a comfortable sun lounger, or enjoying a midday snack from the beach restaurant. Best of all, it's never really busy, so you'll never have to fight for a space for your towel. For truly deserted beaches in Northern Cyprus, follow the local roads beyond Tatlisu to the rugged Karpas peninsula, where tiny tracks lead to near deserted rocky coves that can be yours all day long. or head to the famous Golden beach, where sea turtles lay their eggs in the sand tinged red by the setting sun. If you prefer more action, just drive 15 minutes down the coast road and you'll discover North Cyprus water sports, golden sands and non-stop fun at Acapulco beach. The historic town of Kyrenia is within easy reach too, just a 30 minute drive away down the new coastal road. For shopaholics, the new Anfora shopping complex at Iskele is just 60 minutes drive away. A new marina is planned for Bahceli in the Esentepe region, so discover the delights of Tatlisu before the rest of the world does with Amy Villas. Just our little secret, eh? This page is prepared in 780 ms.